Cut the tops off the carrots and peel them; discard or compost the tops and peels. Heat a few tablespoons of olive oil in a skillet over medium heat. Add the carrots and shake the pan a little to coat them with the oil. 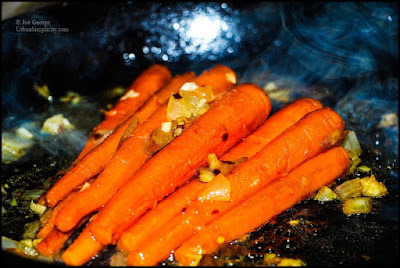 Lower the heat and cover the pan and cook the carrots for a few minutes. Then remove the lid and add a small sliced or diced onion. Cover the pan and cook a few more minutes. Then remove the lid and add a clove or two of minced garlic, as much crushed hot pepper as you'd like, and a pinch of kosher salt. With the pan uncovered, continue to cook the carrots along with the other ingredients, taking care not to burn the garlic. If the onions and garlic brown too quickly, add a couple tablespoons of water to the pan. Then cook the carrots until the water evaporates. The dish is complete when the carrots are soft and flavorful. The entire process will take about 10 minutes.